MEMBERSHIP of Green left is open to Members of the Green Party of England and Wales. It has been agreed by GL meetings that GL should become a subscription based organisation. One reason for becoming subscription based is that we have minimal funds and are dependant on members donations for income. We don´t ask for or get any money from the Green Party although we are a recognised internal GP group, We may wish to influence policies in a certain directions and it follows, that GL may have some disagreements with some parts of existing GP policies and/or their emphasis relative to one another. If we were party funded our independence in this respect could be compromised. The decision to initiate GL subscriptions is also influenced by a degree of mystification as to why some people who have joined the GL mailing lists did so. This is especially so since some of the statements of principles that GL supports are now easily publicly accessible on this website,. If someone holds the perfectly respectable belief that Green politics has in some way totally superceded older left/right political divisions and that there is therefore no need for GL, then surely a GL list is not the place to argue this. So it is hoped that a subscription might give slightly more political coherence to GL membership as well as providing a modest income for things like a banner and some leaflets . 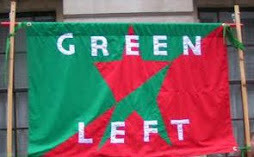 The Green Left Committee has now agreed to do this with a flat rate of subscriptions due annually at the start of January 2012, naturally additional donations from those who can afford them would be welcomed.
" the meeting agreed to the proposal that new Green Party of England & Wales members could be offered 1 yr free GREEN LEFT membership". Members are encouraged to pay by direct debit or standing order. (Optional: Trade Union Membership is not a requirement for GREEN LEFT Membership, but is recommended if possible).